I’ve heard a lot of great things about the Amazon Fire Stick, mainly from men. It almost changes a normal TV into a Smart TV, which means you can watch Netflix, BBC iPlayer and all of those sort of services on your TV without a box or another subscription service. It may just be me or do men always need a new wallet? It seems men update their wallets more than we update our purses and a wallet is always a good present for a guy. This Ted Baker wallet is such a lovely gift and it even comes in a lovely Ted Baker box. I’m not saying that women can’t have a coffee machine for Christmas, but from my experience men prefer the more gadget-ty side of these things. 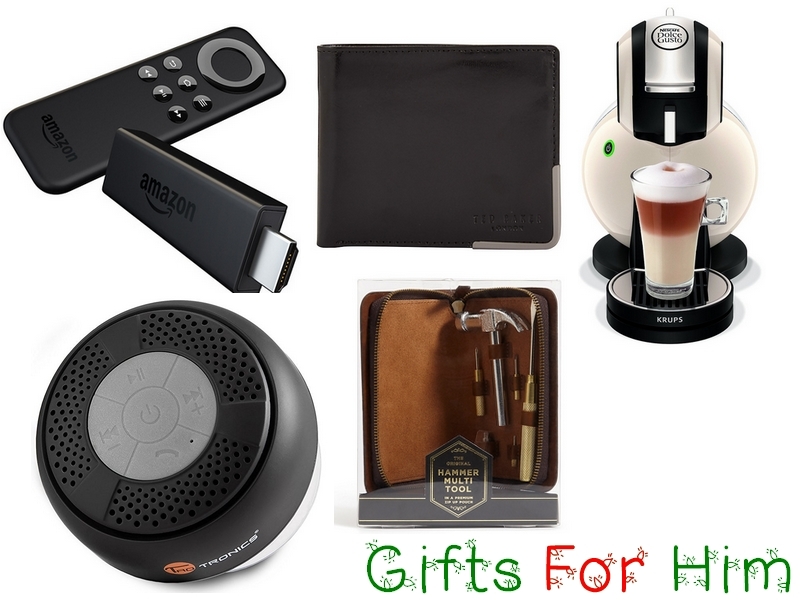 A coffee machine is such a handy gift for those with busy lives and when they make loads of different types of drinks, who can say no to that? Who doesn’t love listening to a bit of music in the shower? This is perfect for anyone that does as it means they can listen to music without potentially damaging their phone and can also pick up calls in the shower. It’s always handy to own a tool kit. This one from M&S comes in a lovely case so everything is together and organised. A screwdriver and a hammer can always come in handy, in a lot of situations!